Rs. 1,73,900 to Rs. 2,24,900. Honestly, TVS Scooters are pretty straight forward. As in, there isn't a lot to choose from, which kind of good. You really get to narrow down your choices and select the one you might really need. Confused? Okay, see what are the things that you need from a scooter. If it does match the things you're looking for, then that scooter might just be it. TVS Motors currently sells just under five scooters in Nepal. However, you are free to choose from different variants and options. Like its motorcycle segment, TVS does give riders a choice, based on the type of scooter one might be looking for. It doesn’t matter if you’re performance hungry enthusiast or hardworking commuter or a simple college kid who loves scooters, TVS has you covered. This list includes all the necessary details you might want to know, plus with pictures! So, without further a due, let’s start with all TVS scooter price in Nepal list! Let’s start the list with the TVS Jupiter. Inspired by the planet Jupiter, it boasts a contemporary style in a large scooter. Also, the design languages are balanced all the way from the front fascia to the tail section. This makes it perfect for all kinds of riders. Unlike other scooters that are aimed for specific audience type, Jupiter takes on a larger customer base. It’s more of a mix of premium features on a daily commute scooter. However, TVS Jupiter is more than just a stylish scooter. You have enough real-world features to make the experience more fun. The engine is mated with a CVT transmission. The suspension is telescopic on the front and gas-charged monoshock on the rear, making it’s drastically different over the traditional hydraulics suspension on the scooter. Your rides will be smoother, comfortable, less bumpy, and more fun. It hosts a unique safety feature called Sync Braking System. Like Honda’s Combined Braking System, it combines both front and rear brakes from more responsive braking. It is a segment first feature in a scooter. Everything has competition and TVS Jupiter is no different. 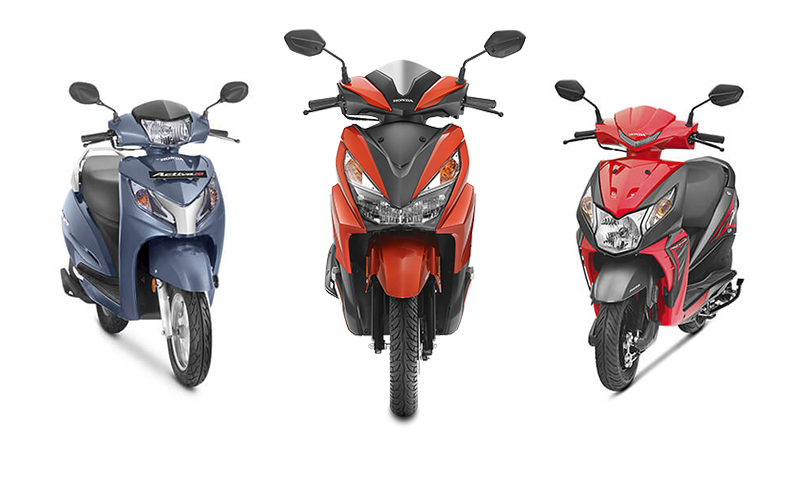 It goes head to head against the likes of Honda Activa, Honda Aviator, and Yamaha Fascino. Since all the scooters provide near identical riding experience, it is very difficult to pick a clear winner. 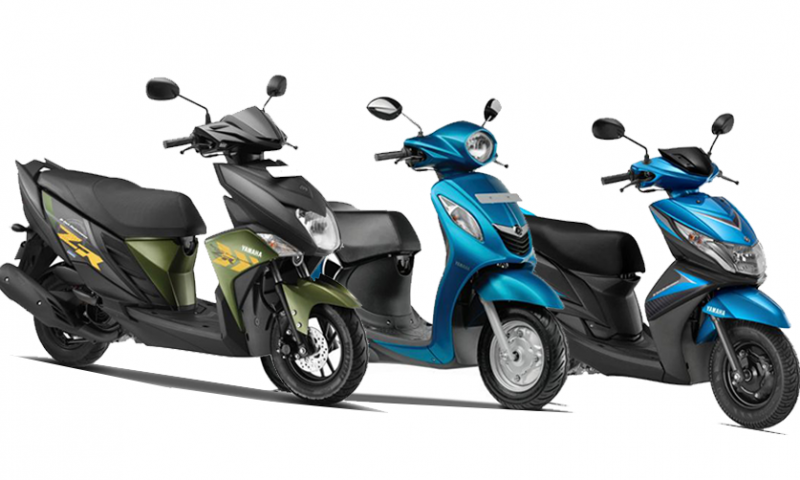 Although, TVS Jupiter will give you more premium feel compared to the other scooters. Which TVS Jupiter should I choose? TVS Wego is the stylish yet slimmer and less bulky sibling to the previous Jupiter. With a unisexual styling, it attracts all generations. It is the luxury full-metal body scooter equipped with high-quality adaptable features. For example, All-Smart Alert system, Full Digital Speedometer reminds you of tiniest details like Service reminder, Low Fuel Indicator, and Trip Meter. So, you don’t have to get stuck with a boring old analog meter. Other modern features include LED tail lamp, golden eye indicators, all-black alloy wheels, anti-skid hysteresis seat, and Sync Braking System. Wego is equipped with a duplex tubular frame chassis. You get an Advanced Telescopic Suspension on the front and gas-filled hydraulic damper on the rear. These somewhat do a decent job to give you a smoother ride. Wego mostly focuses on the body balance and movability with an ideal center of gravity. Another fact I love about TVS scooters is the external fuel filler. So, you don’t have to open your seat for every time your refill. You would give me an entire day to explain how great the scooter really is, and that too wouldn’t be enough. It matches the premium side of Jupiter without taking itself too seriously, which is what a scooter should be all about, fun. TVS ZEST is the latest offering from the most popular lightweight scooters lines up in Scooty. 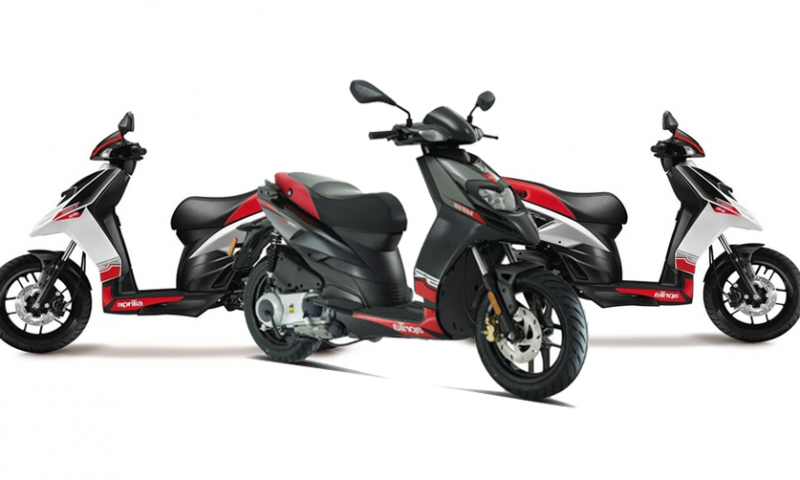 Taking design inspiration from its predecessor, it retains the familiar Scooty looks with its steeply ranked apron, a big headlamp, and vertically stacked indicators. You could call it a better and beefier version to the Scooty Pep. And, it also comes with new features like daytime running lights, antiskid tubeless tires, stylish interior, and attractive design. Although Zest doesn’t come with a top of the line crazy features, it does have some unique perks. It gives the fastest pick up in the segment with 0-60kmph in just 11.1 sec and large 19-liters under seat storage. Though, some of you might prefer to go with other TVS scooters given the absence of Sync Brake and Digital Speedometer. Scooty Zest will give you ride down the memory lanes to those Scooty Pep days. It’s not the perfect scooter out there but gets the job done. It’s just a fun little scooter for a younger rider, matched alongside funky colors. TVS NTorq is the only 125cc scooter from the company. It might seem like just another generic scooters, but it isn’t all about the exterior design. It gets first of its kind, all digital 5-inch instrument cluster. There is so much information at your disposal. It is equipped with a temperature meter, fuel gauge, odometer, twin trip meter, and a clock. For performance, it also gets lap timer, and display both the top speed along with the average speed. The riders can toggle between various modes like Sports, Street, and Eco. 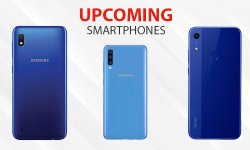 NTorq has the capabilities to connect with your smartphone via Bluetooth. This opens a whole new section of features. Riders have navigation assist, call alert, last parked location assist, ride stats, and so much more. On top of all that, this is among the first scooter to get an engine kill switch and hazard light. 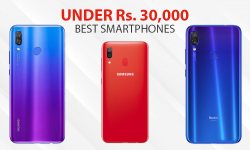 Grabbing the attention with its edgy design, innovative features, and the amazing introductory price tag. There’s a lot this scooter can do. It is clear the TVS has put a high hope on NTorq to be the next segment-leading scooter. 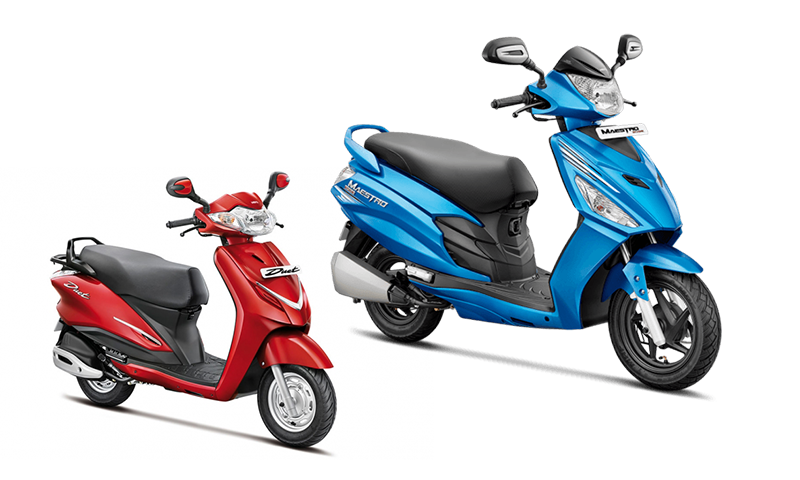 It goes head-on against the likes of Suzuki Access 125 and Honda Grazia. Though, NTorq has an edge against them being a newly launched scooter. The TVS XL 100 is a 100cc moped aimed at the rural markets and Terai region of Nepal. Powered by a 100cc single cylinder four-stroke engine, it delivers 4.3bhp and 6Nm of torque. The engine is mated to a single-speed gearbox with a centrifugal wet clutch. Tipping the scales being just 80 kilograms, the XL 100 can carry a payload of up to 130 kilograms. The 16-inch spoke wheels ride on conventional telescopic suspension in the front and dual hydraulic springs in the rear. It gets drum brakes for both wheels. Talking about the bad factor, the fuel tank can take up just 4-liters of fuel with a fuel efficiency of 67kmpl. So, we’re at the end of our list. Honestly, TVS Scooters are pretty straight forward. As in, there isn’t a lot to choose from, which kind of good. You really get to narrow down your choices and select the one you might really need. Confused? Okay, see what are the things that you need from a scooter. If it does match the things you’re looking for, then that scooter might just be it. On a personal note, I am a big fan of TVS Scooters. If I had to choose among the best TVS Scooter in this list, it would be TVS NTorq. Without a inquest, NTorq has established itself as an all-rounder, offering, perhaps the first of its kind, the great instrument cluster. It’s stylish, popular, and comes with all things that make it a good scooter. Personally, I do believe that its worth every penny it is asking. And, there isn’t anyone else whom I could compare. That’s all about the TVS Scooters in Nepal along with their key specifications. We’ll continue to update our list and the prices as more scooter rolls in. If you have any questions related to the scooter above, feel free to leave us your questions below!